K BAR R Ranch & Arena chose our rodeo contractor, Barnes PRCA Rodeo, because they are an elite and award-winning contractor. 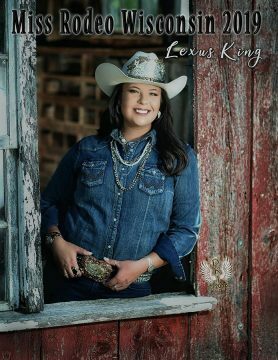 They are committed to high end Rodeo production whether performing in small towns or state fairs. Their trophy livestock is the heart and soul of their company. 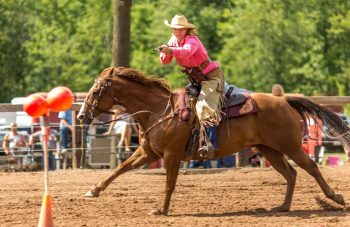 Bringing bucking horses, bulls and saddle horses recognized for their athleticism translates in to a great show for our rodeo fans. Top cowboys continually select their livestock when competing in the Super Bowl of Rodeo’s each year at the National Finals Rodeo in Las Vegas. 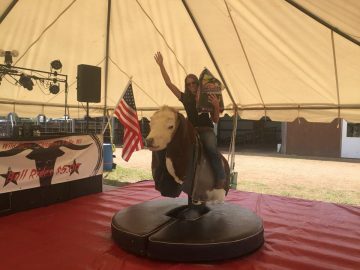 We are proud to bring a taste of that Rodeo to Medford, Wisconsin. 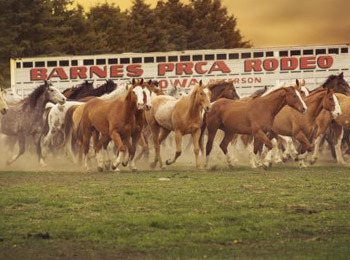 Barnes PRCA Rodeo Company has been bringing Pro Rodeos to the public since 1950. Founded and still headquartered out of Peterson, Iowa, they are a member of the Professional Rodeo Cowboys Association. Visit their complete schedule here. You hear the voice, but you hardly ever see the face of the voice or ever really get to know who he is. 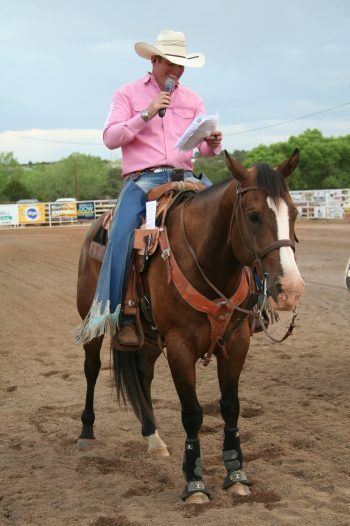 So please read about and get to know your K BAR R PRCA Rodeo Announcer. Trey grew up in Louisville, KY and began going to rodeos at a young age. He started his rodeo career as a bull rider, of all things. After several years of riding bulls, he laid his bull rope down and picked up the microphone and began his career with his gift to gab. He graduated from Murray State University in Murray, Ky. with a Bachelors Degree in Animal Science. He then went to Chad Nicholson Announcing Seminar and began perfecting his trade. Since that time, he has announced rodeo’s from the west coast to the east coast and numerous stops in between. He has announced PRCA rodeos in AR, MO, TX, FL, NM, MS, OK, and many other places throughout the United States. Trey has won numerous awards; a few of which are: International Finals Rodeo 43 Showcase Champion Announcer. Trey was selected to announce the 2012, 13, and 14 Iowa Rodeo Cowboys Association Finals from a field of many announcers. He received the award of the 2012, 13, and 14 Announcer of the Year in the Midwest Cowboys Rodeo Company. 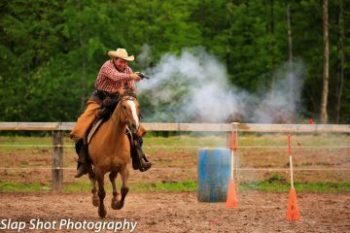 He has also worked the 2012 Minnesota High School Finals Rodeo, 09 and 10 Kentucky High School and Junior High Finals Rodeo. Trey is a Christian and married to his wife, Amber, with their two daughters, Olivia and Piper. They currently live on a farm in Poplar Bluff, MO where they raise cattle and Labrador Retrievers. He enjoys playing golf, drums and guitar. During the fall and winter months he enjoys duck and dove hunting. He also enjoys a good Netflix Series in his down time. As you can see Trey is more than just a voice behind the microphone. So, when you come to the K BAR R PRCA Rodeo and you see him walking and talking, which he does a lot of, stick your hand out and say hello. Some kids are born into a rich family; I got lucky and was born into a Rodeo Clown family. I was blessed to learn from a man very good at his profession. However, when most dads are teaching their sons how to hit a baseball or throw a football, my dad was teaching me how to put on makeup???? 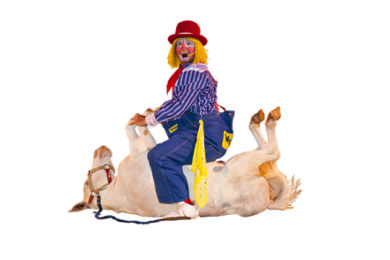 I only had to work the arena for a few very terrifying years before I got my first Clown Barrel. It was the greatest thing in the world to think that I would never have to run from another 2,000 pound steak. That was until the first time I used the barrel and the bull charged it. He knocked it end over end with me inside, and I realized that the freedom of running away sounded pretty darn good at that point. But there is no escaping this bull version of a piñata. It was like going to six flags except the roller coaster was trying to get inside the cart with you. From that moment on I knew I wanted to be a barrel man. Some folks think that I may be a bit crazy to do what I do for a living. I just enjoy helping others and making people laugh. If I can take those people who know what hard times are and give them two hours to relax, forget about their problems and enjoy themselves with quality family entertainment, then I feel like I’ve done my job. That is why after the rodeo has ended, I will always be found at the exits signing autographs and thanking everyone for coming out. I never forget that all of us in this profession could not do what we do if it wasn’t for the spectators and sponsors coming out to support us. I will never forget my fifth grade teacher telling me that acting like a clown would get me nowhere in life; I just wish she could see me now as I am traveling this great country, doing what I love. 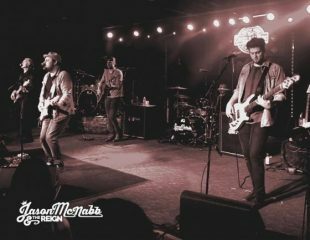 Growing up in Manitoba, Canada – what he would call the “Paris” of the prairies – Jason naturally gravitated toward hard work and country music. It wouldn’t take long for the two to go hand-in-hand either. Jason started performing live in front of audiences at the age of 12 while playing drums in the family band. Not long after that (or at least not long after his first teenage heartbreak), Jason began writing songs. The emotional relief and personal gratification after that first “gem” would be the gateway to a lifelong songwriting addiction. On the stage is no different. 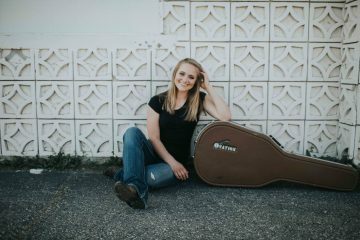 Jason can fill the room with a fun and explosive energy during upbeat song selections, and also a raw vulnerability that will leave you hanging on every word during the seldom ballad. 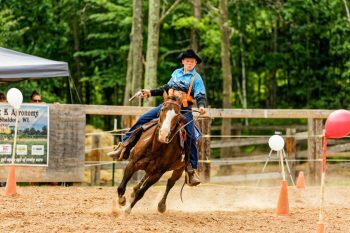 Mounted Justice is the Wisconsin CMSA (Cowboy Mounted Shooting Association) Club. This is a sport that everyone can participate in! The sport is open to men and women of all ages and horses of all breeds. It also includes a junior and wrangler division for kids. New participants compete against riders in their same level. Contestants use two .45 caliber single action revolvers with blank ammunition. A competitor crosses a time line, engages 5 targets, returns the empty revolver to the holster, then draws the second revolver and engages the final 5 targets. The riders are scored on time and accuracy. 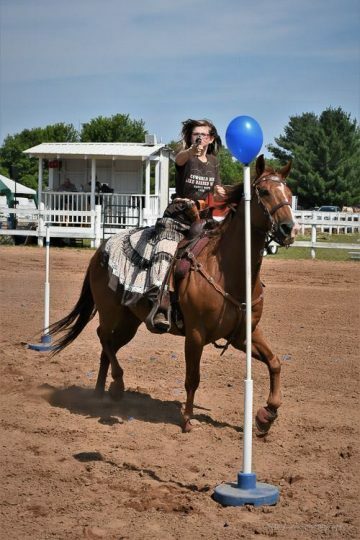 There is a 5 second penalty for each missed balloon, a 5 second penalty for dropping a gun, a 10 second penalty for not running the course correctly and a 60 second penalty for falling off your horse. Speed is important, however, accuracy is usually more important than speed. A typical pattern can be run in 15-35 seconds, so penalties can really hurt. It is required that you dress western. You may either dress in traditional western style or you can dress in the old time style of the late 1800’s. Traditional style includes a long sleeve western shirt, 5 pocket blue jeans covered by chinks or chaps, western boots, and a cowboy hat. If you prefer ‘rolling back the clock ‘ to the late 1800’s try to look as authentic to the period as possible, by wearing shirts without collars, and high-waisted pants with buttons, not zippers, and an old style cowboy hat, for example. Hello! My name is Taylor Asplin. I am a Farm Production Consultant for Purina Animal Nutrition at Provision Partners Cooperative, here in Central Wisconsin. I am here to provide you and your hobby or business with expert nutrition advice for a range of species! My background, and passion is for the equine industry where I actively ride and show in the regional ApHC circuits. I resided in Marshfield before attending the University of Wisconsin River Falls to obtain my degree in Equine Science leading me to on farm sales, which I’ve done for the past 3 years. Apart from horses, I also have a great deal of training and resources in the grass cattle business, livestock show animals, pet, backyard flock, and exotics. I look forward to being your go to nutrition resource in Central Wisconsin!